As we head towards National, I want to take a look at a deck that isn’t really being discussed at all and that might pop up in some numbers at U.S. Nationals, which are a pair of Accelgor variants. Accelgor is a deck I’ve played seldom, but I’ve very much enjoyed every tournament that I played the deck in. I won my first tournament ever going undefeated with Gothitelle/Accelgor at a Battle Roads in the same format that it won U.S. Nationals. I played Gothitelle/Accelgor with a Garbodor tech for 3rd place at a City Championship before finally being bested by a Virizion EX/Genesect EX deck. I made Top 32 at Kansas City Regional Championships this past year with Flygon/Accelgor, and this past weekend, I made Top 8 with Trevenant/Accelgor at a 46 player, mixed division Tropical Beach tournament. While I haven’t played Accelgor as much as I probably should have over the course of its lifespan, it’s generally treated me pretty well at the tournaments I have played it at, with the exception of a misguided Darkrai EX/Accelgor deck I tried at a City Championship two seasons ago. I actually even got in on some of the original deckbuilding for the Chandelure/Vileplume/Mew Prime version of the deck, before opting to play Darkrai EX/Chandelure NVI for Nationals 2012. In short, it’s been a very strong card ever since it was released, and because of that, it is a card worth talking about before Nationals, even if no one else wants to. Why is Accelgor so strong? First, lets look at what makes the basis of a strong Accelgor based attack. 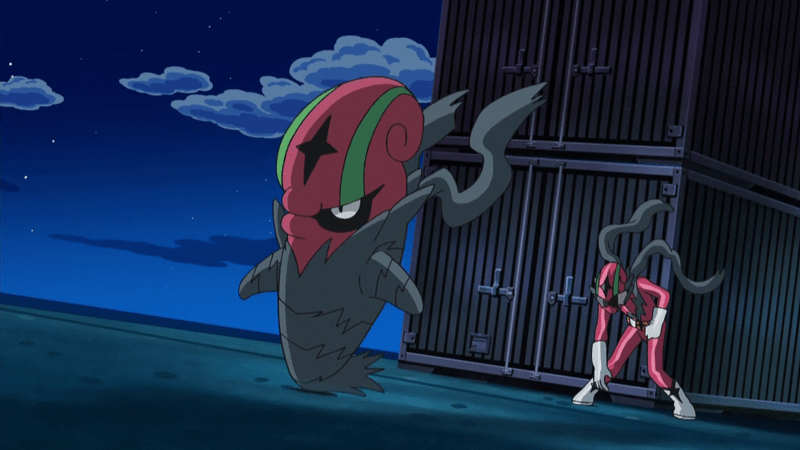 The very basics of the deck is Accelgor, which is a Stage 1, whose Deck and Cover attack, which costs [C][C] does 50 damage, and paralyzes and poisons the opponent’s Pokemon. Just on the base, this is very strong, it does a significant damage output, while paralyzing the opponent’s Pokemon. Paralysis is the strongest status condition in the game because your opponent cannot attack or retreat when they are paralyzed, so the Pokemon is just stuck there to do nothing. 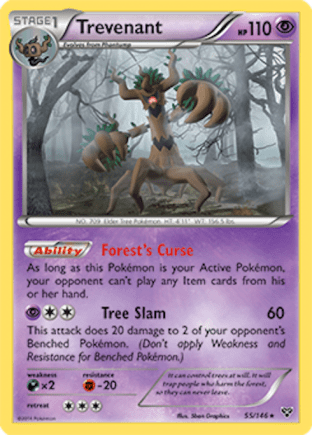 Opponent’s can of course Switch out of the Paralysis, but they then need something else to attack with or a way to retreat back into their Pokemon with Energy, and they only have a finite amount of switching cards, and between their own discards to get Energy out to attack, and being forced to escape paralysis, those switching resources disappear fast. When I was testing the Chandelure/Vileplume variant before Nationals 2012, one of the observations I made is that I could still win games even when I didn’t get my Vileplume UD in play, showing just how strong being able to Paralyze your opponent is. To make matters even better for Accelgor, there have been Basic Pokemon that could replicate its attack, all of them being Mew. 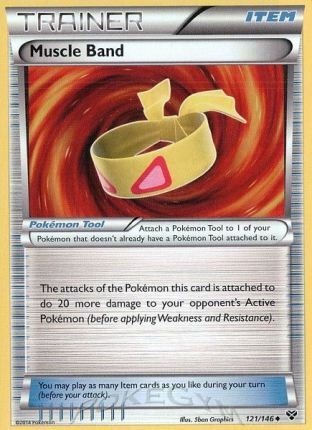 The first was Mew Prime, which would use Lost Link to copy Deck and Cover from an Accelgor in the Lost Zone. 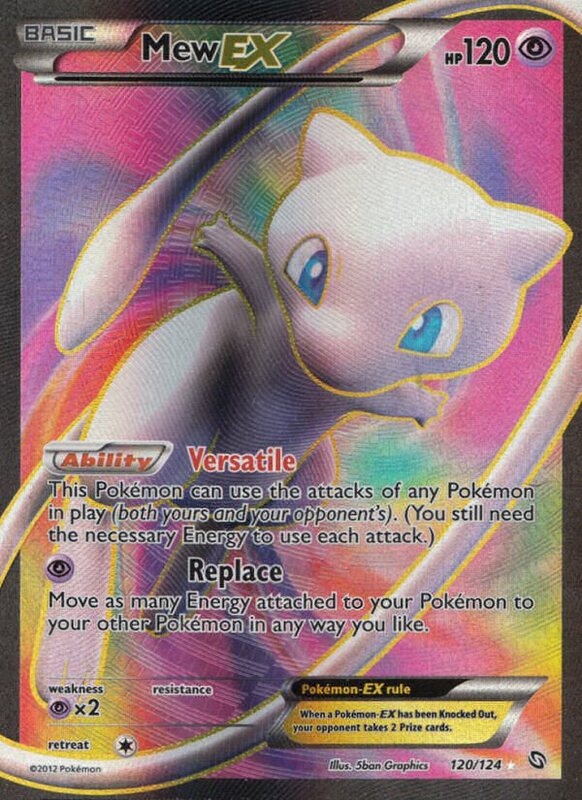 Now, we have Mew EX which copies Deck and Cover with Versatile. Being able to put a Basic back into your deck in place of the Stage 1 gives you a huge advantage in being able to stream Deck and Cover continuously throughout the game. And about those Switching cards, Accelgor decks can use an Item Lock Pokemon to prevent opponent’s from Switching them out, locking the opponent in place for sure under most circumstances. Originally, the pair was Vileplume UD, which could sit safely on the bench shutting off Items, then we moved onto the Stage 2 Gothitelle which had to be Active to shutoff Items (which is fine when Accelgor goes back into the deck letting you promote another Pokemon in it’s place in between turns), and finally, we moved onto the Stage 1 Trevenant, which does the same thing as Gothitelle, just on a Stage 1 Pokemon. 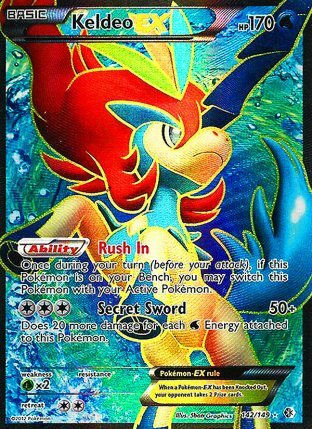 However, the most compelling reason to play an Accelgor deck is the idea of a perfect lock. We started off with Chandelure NVI, whose Cursed Shadow Ability let you place three damage counters on your opponent’s Pokemon in any way you like. During the lead up to Nationals 2012, I had a notebook, where I just filled it with every Pokemon I could think of that I might encounter, listing off exactly how many damage counters I would need to place on each different Pokemon in order to maintain the perfect lock. I’m sure most of the players that ended up actually playing the deck took similar measures. This makes the Chandelure/Vileplume variant of the deck perhaps the greatest incarnation of an Accelgor deck, just because of the great damage calculations that needed to take place to do well with the deck. 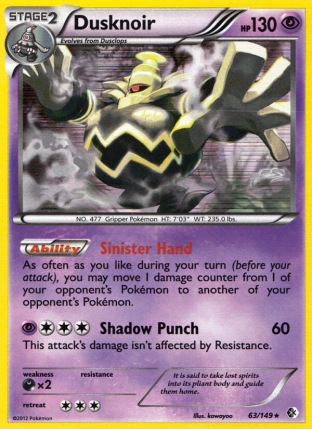 With the release of Boundaries Crossed, we gained Dusknoir BCR, which let you move damage counters around your opponent’s field in any way you like. With it, you traded the damage acceleration that Chandelure provided you much more leeway in how you locked your opponent. With all that said about Accelgor being such a great card, why isn’t it seeing more play? Starting with Boundaries Crossed, we continuously gained more and more cards that could deal with the Paralyze lock while also playing around the Item Lock. First up is Keldeo EX, which is a natural fit in decks with Darkrai EX. You use Keldeo’s Rush In Attack Ability with a Dark Energy attached, and then retreat to one of your attackers. With a lot of Yveltal/Garbodor decks opting to drop Darkrai EX, for a good deal of them, adding two cards to deal with a little played deck is probably not in the plans. 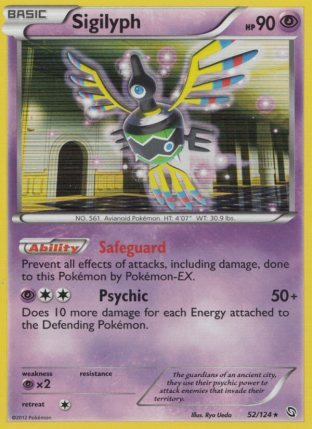 Next up, and the biggest threat, is Virizion EX, which shuts off all Status Conditions for any Pokemon your opponent has a Grass Energy attached to. This is obviously big trouble, as it throws out using Paralyze lock as a dominant game factor. It fits most obviously into Virizion EX/Genesect EX decks, as well as Aromatisse and Hydreigon decks that play Rainbow Energy. In general, I’ve found the one teched Virizion EX easy to get game states in which you win the game. It also can be fit into Plasma decks, since they tend to run just Prism and Rainbow Energy. Plasma Blast also gave us Genesect EX, whose Red Signal Ability can get the Trevenant out of the active position. It fits of course in Virizion EX/Genesect EX, forming a nightmare that not only can shutoff your Status lock, but also work around the Item lock. Genesect EX can fit into Plasma and Aromatisse decks. 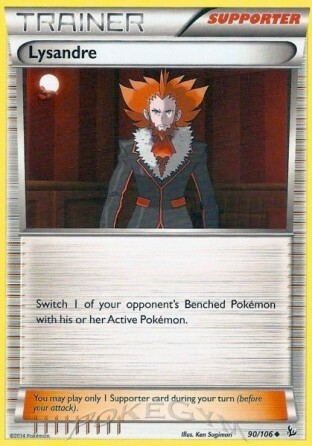 The last card that will see play that is a hindrance to Accelgor is the newly released Lysandre Supporter card, which can be used to Switch Trevenant out of the Active Position. I think it’s impact on Accelgor decks is overstated, as your opponent also needs a Switch when they play the Lysandre to escape Paralysis, and even if it buys them a knockout, I don’t think the typical 1-2 Lysandre played in most decks is enough to swing the matchup. Genesect EX’s Red Signal is much more disruptive because they can Red Signal, while also using a draw Supporter to get more resources. Yveltal decks for example, typically only play one Switch card at most, and it won’t be very likely for them to have Lysandre and Switch in hand at the same time to make too much of an impact on the game. Over the course of the six rounds of 50 minutes, best of 3 Swiss, I had 1 Win and 1 Tie against Yveltal/Garbodor, 1 Win and 1 Loss against Virizion EX/Genesect EX, a win against Emboar, and a win against Mega Kangaskhan EX/Aromatisse. I actually almost won the first game against the Virizion EX/Genesect EX I played, falling a DCE short of being able to Circle Circuit with Mew EX for the win. My only Supporter in hand was an N, so I just had to pray I could hit the DCE and Pokemon to bench for the win, and only got the Pokemon to lose the match. I ended up scooping my Top 8 match after seeing I was paired against Virizion EX/Genesect EX to leave a little earlier to get dinner after a long day of Pokemon. I don’t think I played the necessary cards to beat a Virizion deck twice in 75 minute top cut, my one win in Swiss was a 1-0 victory that was able to be pulled off thanks to the limitations of 50 minute swiss, but that wouldn’t happen again in 75 minute Top Cut. I looked over a lot of lists for Accelgor decks headed into the tournament as I never spent too much time thinking about playing Trevenant/Accelgor for a tournament before, discussed the list with players who have had success with Accelgor in the past, and then used my own experiences with Accelgor to make this list. Some things to note: I like the thicker Accelgor line, as it lets me send Accelgor in with Deck and Cover more safely, with less fear of not drawing another one. Another reason I like the thicker line is I think Deck and Cover with Silver Bangle is very good, and very underrated. For example, against an Yveltal deck, even if I don’t have Dusknoir out, I can Deck and Cover once normally, for 70 going back into my turn, and then use Deck and Cover with a Silver Bangle, to have it go back at 170 going into my turn, perfectly locking a Yveltal EX without the help of Dusknoir. At the same time, I think using Mew EX to Deck and Cover is also really strong, and is ideal to sending Accelgor back in if I’m not using a Silver Bangle. That lets me leave two Accelgor lines on my bench, leaving me in a safe position if one gets gusted up and knocked out. It also makes streaming Deck and Cover much easier. The last Pokemon trick I picked up from some others is to play Sigilyph DRX. It can provide a wall as early as turn one as you get setup, and it also makes for a great last ditch effort towards the end of the game in desperate situations. Additionally, it’s actually a superior wall to Trevenant against Virizion/Genesect, as it forced them into some awkward situations where they either have to Red Signal around it, G-Booster it, or devote Energy to something like Raichu, and if it’s a DCE attached to Raichu, you can then successfully Deck and Cover it, which can be devastating if you can pair it with an N to 1 in the late game. The last thing I’ll touch on is my ball engine, which is something I took from what I saw other players playing in their Trevenant decks during State Championships. With 8 total balls, you are just able to fill up your bench and get out all your Pokemon that you need very quickly, giving the deck insane speed. I almost played the Heavy Ball, which lets you get Shelmet, Trevenant, and Dusknoir, but ended up just playing 8, as that’s probably enough. It would be nice to cut down to just two Level Ball to open up more tech options (I played 6 balls in most of my Gothitelle/Accelgor lists), but in a Stage 1 variant, that speed is too good to pass up for teching. Lastly, I want to touch on the two last minute changes I made to the deck before the tournament, one that was positive, and one that was negative. If you reverse my negative change, and make one further change I’ll discuss below, you’ll have what I believe to be the optimal list for Nationals. 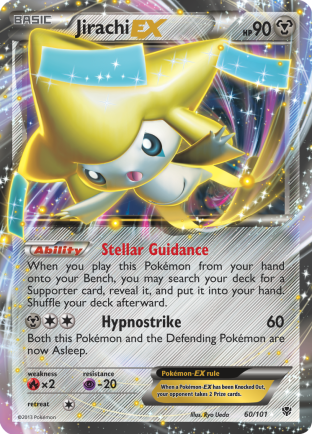 The first change I made is cutting a Skyla out of the deck for Jirachi EX. I didn’t get time to test the deck before the tournament, just because of the nature of people not wanting to play against Trevenant online, so I ended up just sitting there playing out opening scenarios to see how the deck drew, and how my setup would progress. After just a few solitaire games, it became clear that I would hit a speed bump sometime in the first 3-4 turns of the game (this would be lessened in actual tournaments, as sometimes opponents would N me out of these scenarios). However, that was enough for me to make the decision to put Jirachi EX in my deck, as it is obviously a natural fit in a deck with 8 balls, and with so many other Basics, you are less likely to start Jirachi in this deck than any other deck. With Jirachi in tow, I now had a total of 25 cards in my deck that would give me a Supporter to start the game. Jirachi served as an MVP of sorts, saving me from some tough spots, and allowing me to keep momentum in others. I used Jirachi EX in just about every single game (with the exception of Genesect, where I would prefer to not bench it to have the most optimal bench for dealing with that deck, however Jirachi still saw some play in that matchup), and the one match I tied against Garbodor, the game I lost, I couldn’t use Jirachi EX to save me because a Garbotoxin lock got stuck active as I dead drew. The number of different scenarios I used Jirachi EX in was quite large. In the play in game for Top 8, I had a hand with two Double Colorless in hand and a Professor Juniper, knowing my opponent probably played Enhanced Hammer, leaving one on Mew EX, and discarding the other would have left me with just 1 DCE in deck (as one was prized), leaving me in a poor position. I chose to use my Ultra Ball to get Jirachi EX for a N to save a DCE, and after my DCE on my Mew EX got Enhanced Hammered off, it became clear that Jirachi saved me that game. In other games, I would use Jirachi EX to seal the game, grabbing a Skyla for the game winning Item I needed, or to grab a Colress for 10, or a Professor Juniper to draw out my deck and ensure myself the win. Overall, playing Jirachi EX let me be competitive in this tournament. The cut I made from the deck that I regret doing is cutting my Mewtwo EX, for a Lysandre. Lysandre isn’t too great in this deck, as you can’t Skyla for it like you could Pokemon Catcher in past Accelgor variants, so you’re really depending on having everything you need in hand for the turn as well as Lysandre to make use of it. 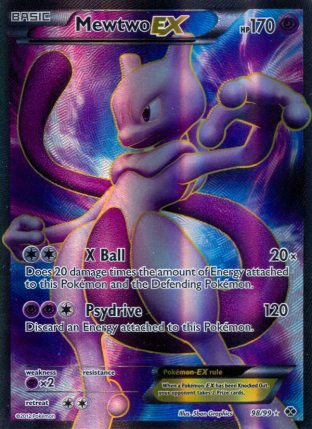 Mewtwo EX, however, could have had much more of an impact. It makes for a great last ditch attacker, as you play plenty of Double Colorless to use X-Ball. I thin it greatly improves the Virizion EX/Genesect EX match for this reason. In my matches against those decks I used Circle Circuit a lot with Mew EX, but playing Mewtwo EX gives you the option to play your own Pokemon for a similar damage output. There are some cute plays you can make with Mew EX, for example, with the Raichu on my opponent’s bench, under some situations I was able to use Circle Circuit for 100 damage, and then Mew would get hit by something, and then I could Deck and Cover to wipe off the damage. Muscle Band lessens Mew’s usefulness in the Virizion matchup, as they can then OHKO it with Genesect EX, but if you’re able to Megaphone off their Muscle Bands, and they can’t get more, you can pull off this trick with Mew EX. With the Mewtwo EX in the deck, I think you stand a great chance of beating Virizion EX/Genesect EX decks, and I’m confident I could have at least navigated the two I played in Swiss to victories if I had played Mewtwo EX. Here is how I would approach that matchup, go for Deck and Cover in the early game just to build up damage, while evolving into Dusknoir. Sigilyph is probably your ideal wall here, as it can buy you turns when your opponent doesn’t take a knockout (Trevenant can be good on turn 2 wall, as Virizion EX won’t knock it out as your opponent uses Emerald Slash however). With Silver Bangle, you can get some good damage output early. Then after three prizes have been given up, I would transition to a Mewtwo EX game. With Dusknoir hopefully in play by now, you have a lot of flexibility for setting up KO’s for Mewtwo EX, or just setting up the Genesect EX in particular to be knocked out from a Deck and Cover (that would be leaving them at 120 damage). Against a Genesect EX with three Energy, you can X-Ball for 100, and Mewtwo won’t get knocked out in one hit, unless they play G-Booster, which isn’t the worst scenario ever, as then they discard Energy, probably preventing them from attacking with that Genesect, and then you just move damage to the Genesect that actually has Energy and can attack, depleting your opponent’s options. Between your X-Ball(s) and early Deck and Cover, you are probably in a position to at least knockout the second Genesect in one more turn, and Virizion EX isn’t exactly the most threatening attacker against your deck, especially if Sigilyph is still in play. After Mewtwo EX is knocked out, you have a fork in which you can choose to go two different routes. The first is to get Mewtwo EX back in your deck, get it out again, and go back to X-Ball. The other option is to go back to Deck and Cover/Sigilyph to try to finish out the game. You want to pair both of these plays while also N’ing your opponent to 1-card, to try to limit them from doing anything to respond. You use Sacred Ash to get back these Pokemon to re-use these strategies. I’m not saying this makes Virizion/Genesect into a great matchup by any means, but I think using such a strategy makes the matchup into much closer to 50/50 than most players would like to admit. Sigilyph and Mewtwo EX are both strong against Virizion/Genesect, so it’s not too surprising to me that they can be used to beat the deck. 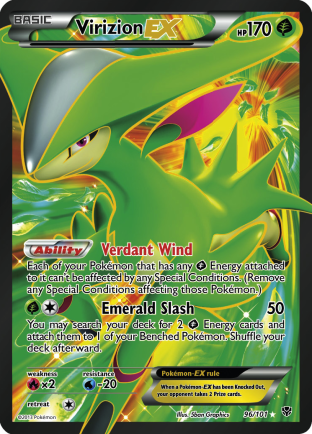 Additionally, Virizion players probably don’t spend much time testing against Trevenant/Accelgor decks, so they may not make the optimal plays when the Trevenant deck starts putting on a strong offensive offensive game plan against them. The last change I would consider is swapping out a Muscle Band for a Silver Bangle. This lets Mew get some extra damage in, and lets you take advantage of the alternate attacking strategies for better damage numbers. For example, with Muscle Band, Mew EX can do 120 on a Genesect EX with X-Ball, and then Deck and Cover for the KO. Two Silver Bangle is probably superior still, just for the math against Yveltal, which will be the most popular deck at Nationals, but it is something to consider at the least. I think Trevenant/Accelgor has some decent matchups. It probably beats Yveltal decks unless they choose to play Keldeo EX and Darkrai EX. Even if they play Keldeo EX, if you can get turn 2 Item lock, you can prevent them from getting Keldeo EX, but if they then choose to play Lysandre on top of those two, then they can get Keldeo EX out mid game with Ultra Ball, but that may be too late if you have enough damage to just knock it out with Sinister Hand (of course they could Lysandre Dusknoir, grab Keldeo, and then knock out Dusknoir, so there are a lot of variables at play for that one). It can have a winning game plan against Virizion with the suggestions above. Plasma is really dependent on the build. It just really depends on what they play, how many Lysandre, if they play Genesect EX, if they play Virizion EX. It can go from good to bad depending on how much of each of those cards they play. Against a lot of the other decks like Charizard/Pyroar, Greninja/Miltank, Emboar, Blastoise, Stage 1’s and so on it has good matchups, while probably having an unfavorable matchup against Aromatisse. There are some new decks that will come at Nationals that I don’t think Trevenant has too great of a matchup against, but I don’t think these decks will be played in wide numbers. For these reasons, I think Trevenant/Accelgor is a solid play for Nationals still, even with all the threats, but only in the hands of a very skilled player. There is enough skill involved in making the right decisions with the core strategy of the deck, that only top notch play will lead to victory using the alternate strategies. I won’t be playing it myself for Nationals, but I think it’s a much more valid play than people give it credit for. The second Accelgor deck I will discuss briefly is Flygon/Accelgor, which saw some success at Singapore Nationals, taking 2nd Place in the tournament. Not much has changed for the deck since I played it at Spring Regionals, so I will say just read the Regional Championship report for more depth on the deck. However, here is an updated decklist for the deck, with some minor changes with the introduction of Flash Fire. Some minor changes to this list from my Regional list. 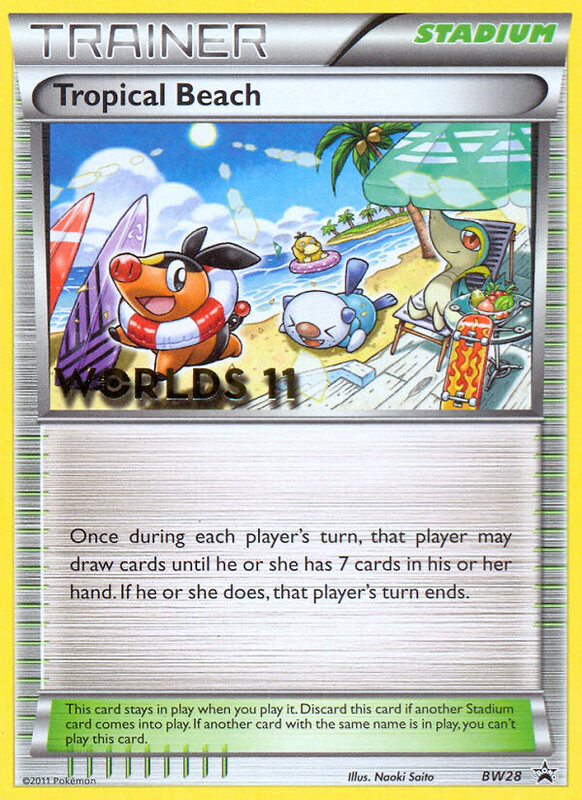 I used the cutting of the 1-1 Trevenant line to add more consistency into the deck by adding a 4th Tropical Beach, and a Colress to the deck. 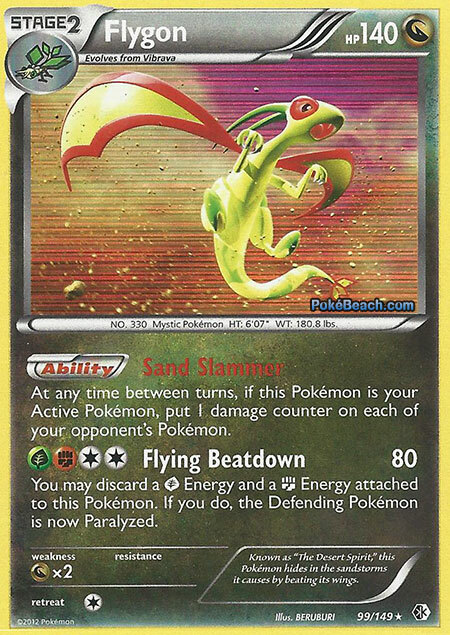 There is less emphasis on hitting a Deck and Cover every turn with this version of the deck compared to Trevenant, as Flygon will still be doing damage for you with Sandslammer. When you have these turns, you want to Tropical Beach for more resources, so that’s why I added in the 4th Tropical Beach, and then another Supporter will help with consistency some. The other changes are just swapping out superior cards from Flash Fire for previous cards that fit the same role. The first is Duskull FLF, which has a Revival attack, which lets you put a Pokemon from your opponent’s discard pile onto their bench. You will rarely use this attack, but it can be game winning, letting you put something like a Jirachi EX back on the field to get knocked out with little damage investment. I cut Tool Scrapper for Startling Megaphone, as getting rid of more than two tools can help you, and you rarely have a situation where you would want to discard your own Tool. I also swapped out Super Rod for Sacred Ash, as it is the superior play since you play no Basic Energy, and you have a lot of different Pokemon lines, where putting in 5 Pokemon over just 3 can be very impactful. I think Flygon is a great deck, and it may do well at Nationals, it has some pretty well rounded matchups, however, after the tie issues I had with it at Regional Championships, it’s not a deck I would play against for 50 minutes, best of 3. And this is probably where Accelgor will leave the modified Pokemon format at, in these two decks, unless someone has a surprise up their sleeves for Nationals using Accelgor. Accelgor has had a great run in the game, being part of three different Tier 1 decks, as well as a great oddball play in Flygon. 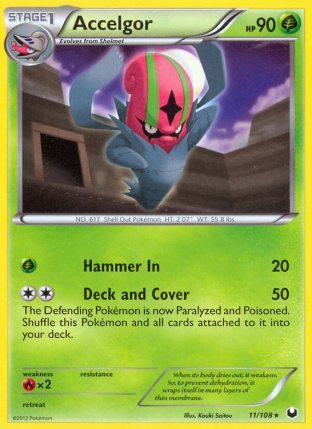 It has come and gone out of the format, but with the exception of Darkrai EX and Sableye DEX, no other Pokemon from DEX has had a more successful modified career than Accelgor has, just showing how strong of a card it is. I think you picked the wrong supporter to talk about in terms of disrupting this deck. Sure Lysandre works for the reasons you stated but I’ve been using Pokemon Center Lady in my deck. This came about after losing to a deck and cover deck first round in regionals. Not only does PCL let you heal the damage done (giving Dusknoir less damage to move), it also heals you of all the status conditions. Then you can just swing back at Trevenant with your active. Again I found PCL to be a lot more effective then Lysandre. The thing is, Trevenant/Accelgor isn’t a very large part of the meta game at the moment, so not many players can be sold on teching for a deck they probably won’t play at Nationals. I do agree, if you’re worried about the deck, Pokemon Center Lady is the better counter to Lysandre. Why not play a higher Colress count in Flygon/Dusknoir? I play 3 Juniper and seem to have to discard a lot of resources early. Since I needed more draw power, I play 3 Colress. These are so good in this deck to ensure you never miss deck and cover, which is so important. What I mean is that 4 Juniper seems like overkill to me. I play 3 and have considered 2. Can you explain why you like Juniper so much? I would assume it is because it thins the deck but don’t you commonly have to discard important cards like rare candy, DCE, etc. ?